Your resource for all things shoegaze and dream pop: Interview v. 2: Geoffrey and Julie of Slowness. Interview v. 2: Geoffrey and Julie of Slowness. 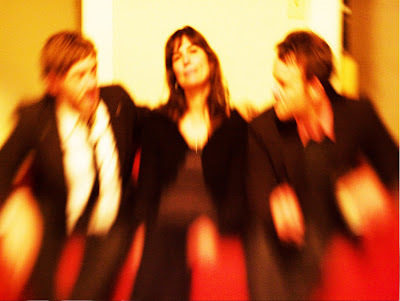 Slowness, based in California, consists of three members - Geoffrey Scott: guitars & vocals, Julie Lynn: bass, vocals & keys, and Scott Putnam: drums & vocals. The trio have been called "a gleaming jewel in San Francisco's indie tiara" (by Signal to Noise), and we can certainly see why! 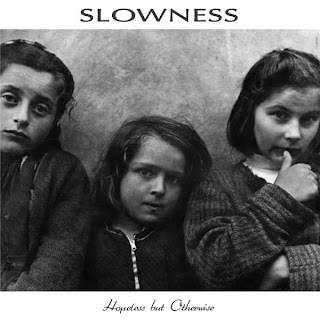 Slowness is a relatively new band to hit When The Sun Hits' radar (shame on us! ), but as soon as we heard their hypnotic drone-pop, we all immediately fell in love and demanded they give us a track for The First 100,000 Compilation or ELSE. Ok, we asked nicely, but that is how excited we were about them! Their EP, Hopeless But Otherwise (which was just reviewed by Rob Turner HERE) blew us away. 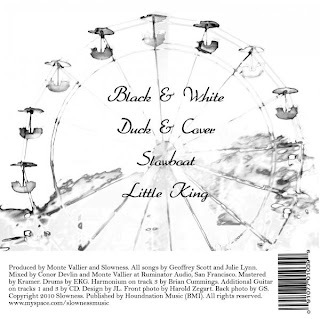 And that, gentle gazers, is how their beautiful track, "Little King", became the compilation closer, and the story of how WTSH fell in love with the music of Slowness. Cheers. JULIE: Geoff and I had been playing music together, informally, for about nine years, so we finally decided to form a band and make a record. GEOFFREY: About three years ago Jules and I edited a movie together. We knew we didn’t want to collaborate that way anymore but we worked well together, so decided to put our heads together with music instead. We asked our friend Erik to drum on some demos with us, which eventually turned into recording the EP with Monte. We did two or three gigs in SF and did a US tour. JULIE: We’ve begun working on a new record with Scott Putnam on drums. He’s also brought a wonderful harmony element to the vocals. Sean Eden (Luna) will add some guitars on it. He also played on a 7” single that we hope to press in time for our shows this summer in NY and DC with Dead Leaf Echo. This will be our first vinyl, so were pretty excited about it. We plan to put the new record out early next year, and support it with a European tour in June 2012. Do you consider Slowness's music to be part of the current shoegaze/dream pop scene, or any scene? Defining one's sound by genre can be tiresome, but do you feel that the band identifies closely with any genre? How do you feel about genres in music, in a general sense? GEOFFREY: We get labeled as shoegaze, which is fine, but we don’t feel confined to that. We do stare at our instruments, for lack of technical ability, but not at our shoes. We never labeled ourselves as such and turn red-in-the-face embarrassed whenever someone asks: “what kind of music do you play?” When we are in the mood to describe ourselves, we feel most comfortable calling ourselves drone pop, which is no established genre at all. JULIE: I spend more time listening to Duke Ellington, Morrissey, The Gogo’s and Sonic Youth. But I do like the bands we’re playing with a lot. Screen Vinyl Image, Dead Leaf Echo, Sky Drops, Tied to the Branches, and Moonbell. GEOFFREY: I can never find the right guitars, pedals or amps, so I buy stuff and then sell it or trade it and then repeat the process. It’s really annoying and expensive. JULIE: It’s changing so fast, it’s hard not to feel behind. This new DIY world has helped us sell our music in Lithuania, Chile, South Africa, Italy, China and a bunch of other countries. There’s something really positive about having a connection with people all over the world. On the whole, it’s positive, but also exhausting. There’s only so much you can do, especially when you have to work for a living. JULIE: We have done everything DIY so far, and that works, but we wouldn’t say no to some help. DIY is very cool, because you’re directly involved with everything and know that you can get it done yourself. The negative part of doing it all ourselves is that it can put a squeeze on playing. GEOFFREY: We buy records and used CDs, the latter of which are great because they are not hip and everyone has shed their collections, so we get to continue building a music library somewhat frugally. Downloads are fine, especially high-quality mp3s and those which come with vinyl. But file-sharing low-grade mp3s is a bummer, unless it’s Metallica. GEOFFREY: We’re all music fanatics. Too many to name. GEOFFREY: Nikki Sixx’s Heroin Diaries. Woody Allen’s new movie. JULIE: I steal other people’s books from time to time and read them very slowly. If you had to choose one Slowness track that was the ultimate definition of your sound, which would it be and why? 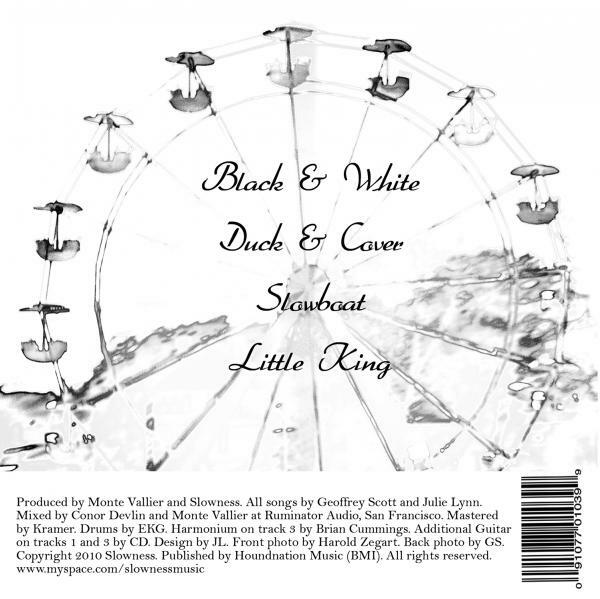 JULIE: Slowboat, because it has some sort of balance in the lyrics between looking both at what is dark and light in life. GEOFFREY: When we were writing it, it went through a very strange transition at one point. It had this really bad, cheesy metal riff, and then Jules came in with the new bass line, and it changed everything. JULIE: Geoff usually comes up with the foundation on guitar and vocals. Then we start coming up with parts for bass and drums. Keyboards usually don’t come until we record. GEOFFREY: For every 10 songs we come up with, two or three stick. Sometimes, a song will linger around like a hanger-on for a year or so, and we’ll play it as part of our live set, or we’ll try to record it three different ways, four different times, until we say, “Song, would you please go away?” And then the song walks away and we feel liberated. GEOFFREY: To continue getting Hopeless but Otherwise out there. To get the 7” pressed and distributed. To finish the new record and have it ready to put out the first day of 2012. And to book the 2012 European Tour. JULIE: We may also try to incorporate keyboards into our live set. GEOFFREY: Despair is the devil. JULIE: Don’t let the turkeys get you down. *Top two photos are credited to Brad Wise and Aaron Campbell, respectively. Nice interview. Great to hear what Geoffrey and Jules are up to. I'm so out of the music scene, I'm not even aware of these music movements! Love and kisses to Slowness. New Video: Rebecca Peake. Even Strawberry. News: Custom Made Music Releases Teaser Video. Video: Giant Drag. This Isn't It. Video: Bethany Curve. Door 2416. An Easier Download of the 100,000 Compilation. Video: Keith Canisius. Ocean Colors. Video: Kyte. Eyes Lose Their Fire. Video: The Lucksmiths. A Little Distraction.